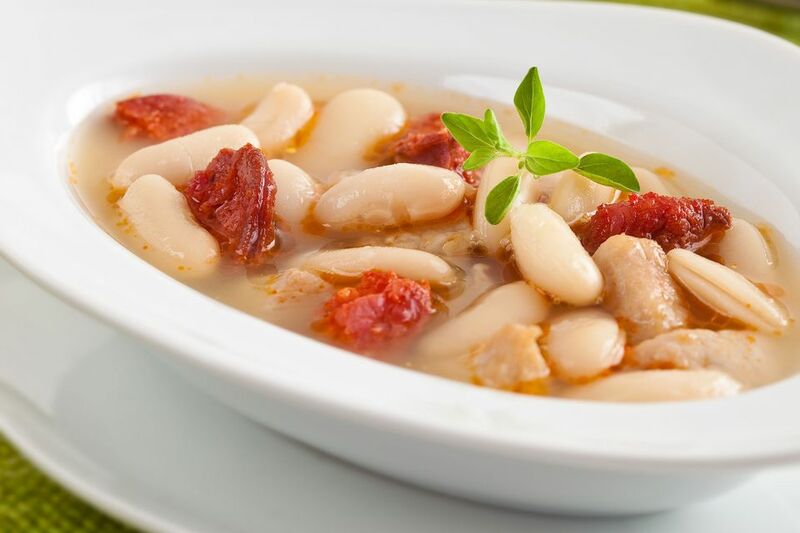 White beans with chorizo (alubias blancas con chorizo) is a quick and easy Spanish dish for those nights when you don't have a lot of time or energy but want to put something interesting and different on your plate. Since the recipe uses canned white kidney beans, most of the work is done for you, making this a perfect dish for beginner cooks as well. White beans combine beautifully with the Spanish chorizo, onions, garlic, and pepper to make a tasty and satisfying main course, ready in about 20 minutes. Consider adding a poached egg—not only for a filling dinner but also a delicious breakfast dish! Chop the onion and the bell pepper. Peel and chop the garlic, but not too finely. Cut the chorizo into slices about 1/4-inch thick. Pour the olive oil into a large frying pan and heat over medium heat. When hot, sauté onion and bell pepper, stirring often. Take care not to burn the vegetables—if necessary, lower the heat. When the onion becomes translucent, add the garlic and chorizo slices. Continue to cook until chorizo slices are browned. Add more olive oil if mixture begins to stick. Reduce heat to low. Quickly rinse the beans under cold water and drain. Add to the frying pan and stir, heating the mixture on low heat. Add salt to taste. Once the beans are hot, serve in bowls with slices of fresh baguette. If you can't find Spanish chorizo, use Portuguese Linguica sausage, which is very similar to Spanish Chorizo and should be easy to find in your local supermarket. Add more vegetables such as zucchini or eggplant and saute along with the bell pepper. Serve alubias blancas con chorizo on slices of toasted bread or inside tortilla shells.